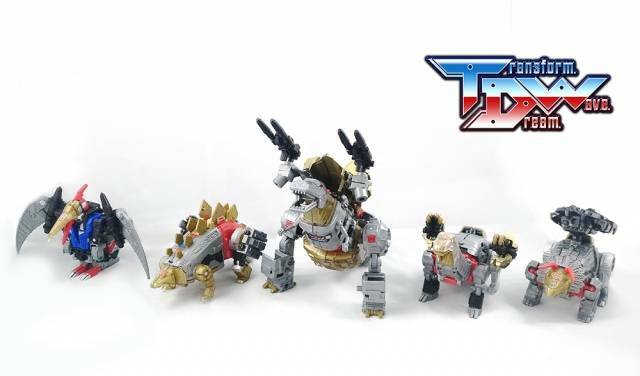 This great set from Transform Dream Wave includes everything needed to upgrade your POTP / Volcanicus Dinobots! Note: Customers who order the first release of this set will receive a free bonus black master sword! This will not be available in subsequent releases of this set. Figures are sold separately. 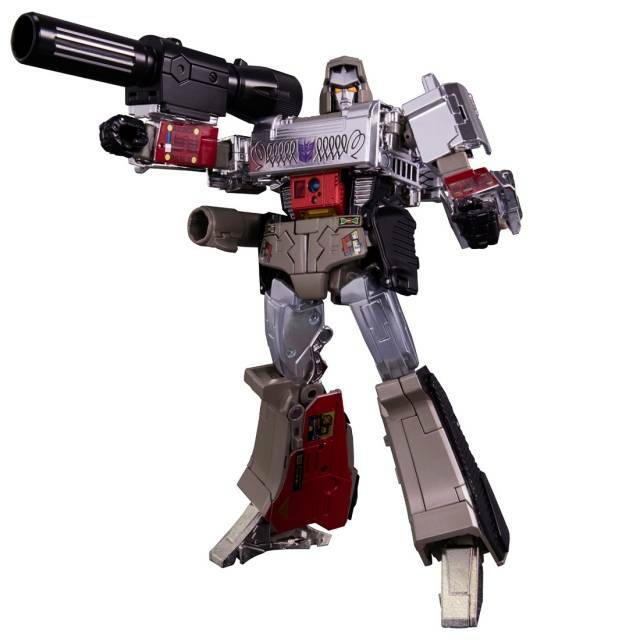 1 x Limited Edition Preorder Bonus Free Gift - Black Master Combiner Sword! Honestly, I wish I could give this 4.5 stars. It really does bump Volcanicus up from 'contrived, attempt at the combiner gimmick' to a legitimate display piece. The color matching and paint apps on the parts and weapons are great, and the design gives him a bulky, primal look that really makes him look like a DINOBOT combiner. His major shortcoming lies in the precision of his design. The designers clearly erred on the side of things being too close rather than too lose. That made a lot of the pieces difficult to install, but most of all the hands - especially the right hand - had to be forced into the original figures 5mm ports, and so stretched, it's unlikely those ports will ever be able to hang onto the vanilla hands again. If you intend to have Volcanicus be a life long addition to your collection, it's worth it, but if you want your figures to remain pristine for resale somewhere down the line, it's a bad idea. The second, much smaller point is that the added mass of the figure makes him harder to pose without support, though PotP Volcanicus wasn't super-stable to begin with, so maybe it's not that big of a difference. Be aware you should sand each peg down for them to fit. Especially Slug because the peg holder on that one is very thin. One of the feet do not properly stay in and the hip articulation is poor... The kitty is good for the hands. So this is the first upgrade kit I've bought for my sets, and I have to say I'm very impressed. I've heard mixed things about buying 3rd party, so I wasn't too sure about this one, but once I received it and saw it in person, I knew I'd gotten my money's worth. 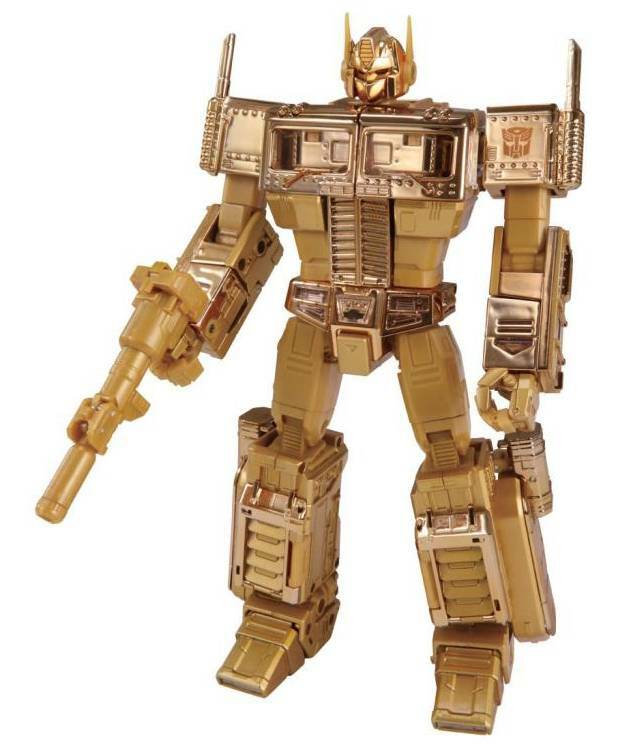 The paint is very nicely done, the gold matches almost perfectly as well. It adds a lot of needed stability to the combiner. One issue I do see a lot have is the rear hip armor is nerve racking to install, due to fear the flaps will snap or bend. 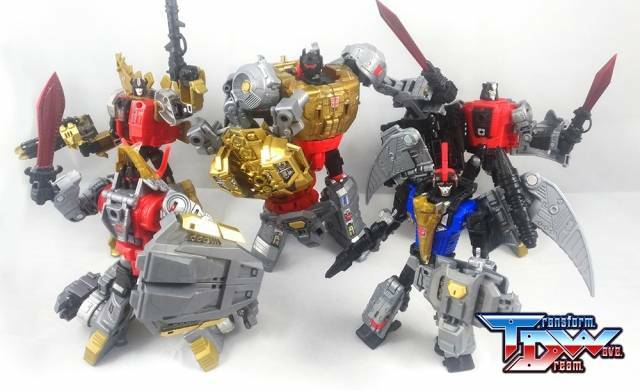 Another is that the Dinobots in robot mode may have a bit of trouble holding their individual weapons due to differences in the size of the pegs and holes. Other than that, I am very satisfied with this kit, and would recommend it to anyone looking for a Volcanicus upgrade. I love this upgrade kit, the weapons/sword are detailed, the quality is good. 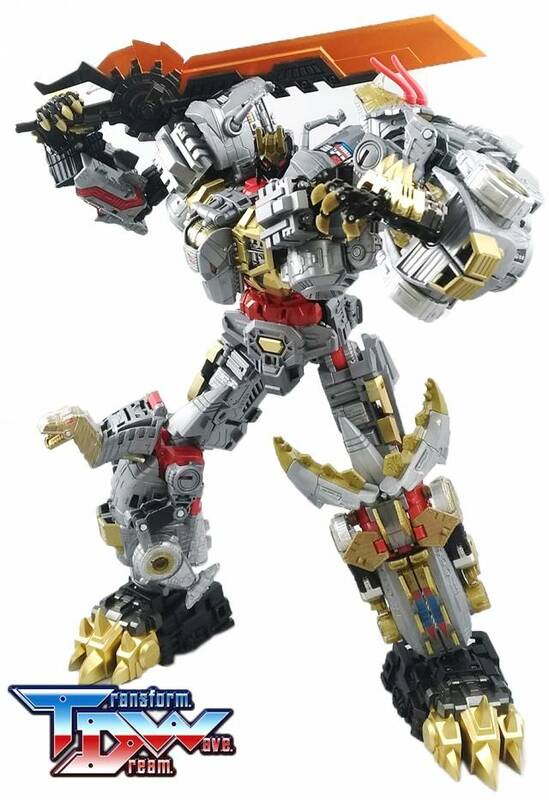 Overall this make the Volcanicus figure look A LOT better, but some of the pieces are VERY hard to get into place, and I have never been able to get the legs right, after putting the upgrades on. This is the first 3rd-party kit I've ever ordered, and honestly, I'm really happy with it. As other reviewers have already noted, there are some issues with the fit of the pegs, particularly those on the hands, but I was able to address those after five minutes with a steel nail file. The wrists are indeed a bit loose, which can cause some posing issues when holding the (beautiful!) BFS that comes with this kit. And yes, the plastic tends to be a bit stiff versus the usual McDonald's happy meal plastic most toys are made of these days, so you need to be gentle when attaching and detaching some parts, particularly the armor for the upper front and lower rear torso. Despite those drawbacks, I'm really impressed with the kit. 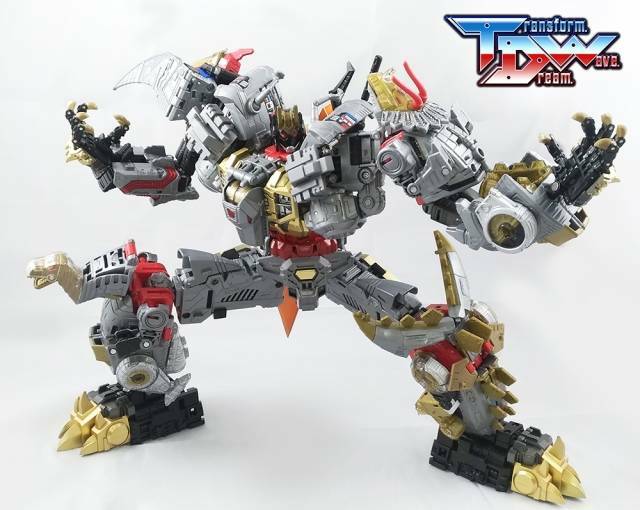 It fixes a lot of the issues with the "stock" Volcanicus design, particularly the awkward placement of the T-Rex legs, and the extra armor gives it a broad-shouldered, sturdy look. The lower rear torso armor even features a bar that you can use to attach Slash as a kind of "tail" - it might seem silly, but having that extra weight in the back actually helps to counterbalance the BFS. And the big clawed feet add additional stability, in addition to looking all spiky and badass. 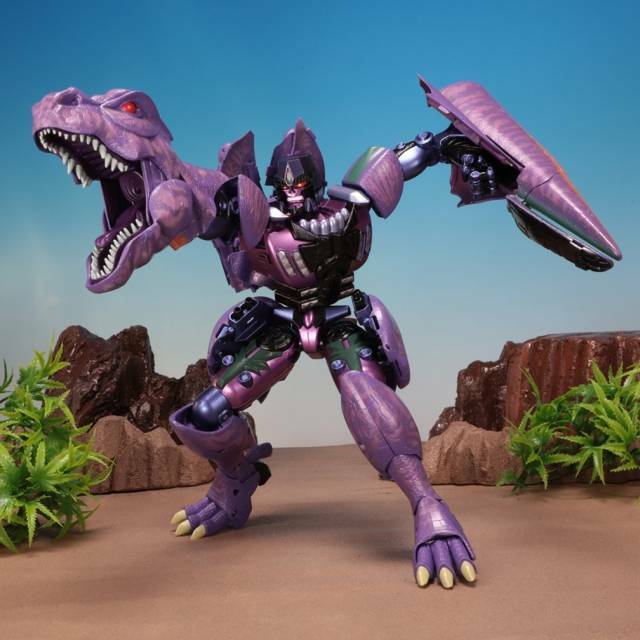 Plus, all the extra weapons and accessories are great for equipping the individual Dinobots, either in robot or beast mode. Just be sure to keep a small Ziploc bag handy to keep all the accessories and/or Combiner parts together when not in use. All in all, I highly recommend this kit. 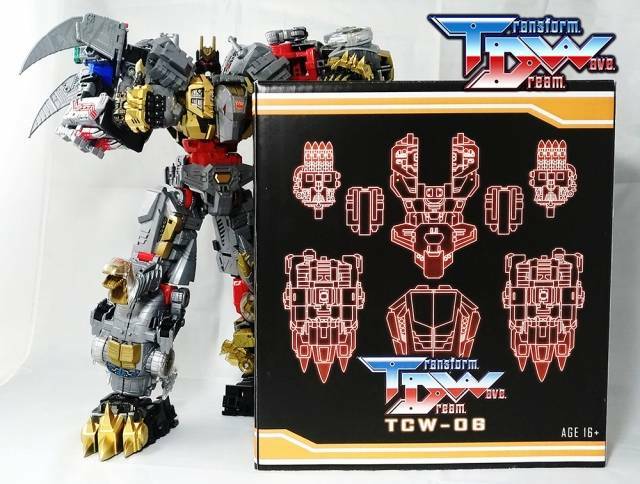 If you're willing to spend the money for the whole Dinobots set to begin with, then you might as well go the extra mile, order the kit, and upgrade them from "nifty" to "awesomely, beautifully badass". Very nice upgrade set to go with your bots, however, make sure to gently test fit every single piece and sand when necessary as sometimes the post are a bit too big to fit and you might crack your dinos as I did on sludge. When removing the chest piece from Grimlock, be extremely (baby hands) careful, as this plastic is not flexible and only held on by two very weak tabs so over forcing it will break these tabs, Mine have stress marks already after 2 installs and i'm scared to take it off again. To sum up, get your sandpaper, superglue,pledge and nailpolish and be prepared to correct the qc issues and you'll be in love with this set. Best DFreamwave Combiner Kit so Far! I've gotten the previous Dreamwave Defensor kit, so i had a little apprehension about this one. However, this kit is definitely worth every penny. It feels much nicer than the older kit, and while there are still some peg fit issues on the hands and feet, they seem to come down more to variances on the Hasbro molds than on the Dreamwave ones, and were far less severe (and no worse than the peg fit issues on a recent Perfect Effect combiner kit I got with it). A couple of the wrist and feet pegs still needed some mild sanding, but only mild (Compared to the mess that was Defensor's kit) and again, no worse than the other kits I've gotten recently. The accessories are awesome, and the paint apps are perfect. Once it's all together it makes Volcanicus ROCK SOLID. Far more than stock. Adds a lot of heft too. I highly recommend this set! Love this add-on. Turns Volcanicus into a swollen beast instead of ab scrawny gangly adolescent. Great quality paint and all-around nice feeling plastic. Besides the obvious fiddly bits you get with upgrade kits like this, little blue tack helps. 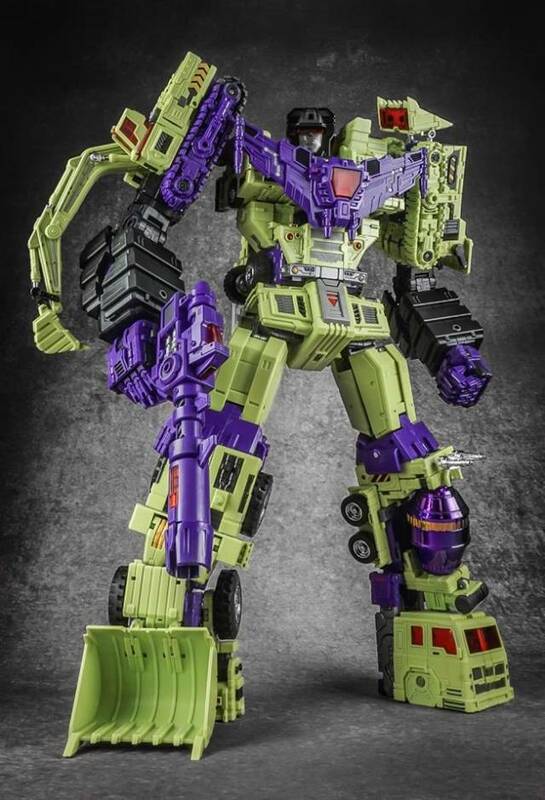 First off, this thing looks *amazing*. The other major player here, PE, has two kits you'll need which cost more, and in my opinion look worse than this. This kit gives Volcanicus more shoulder bulk and doesn't require swapping out whole parts on Grimlock. 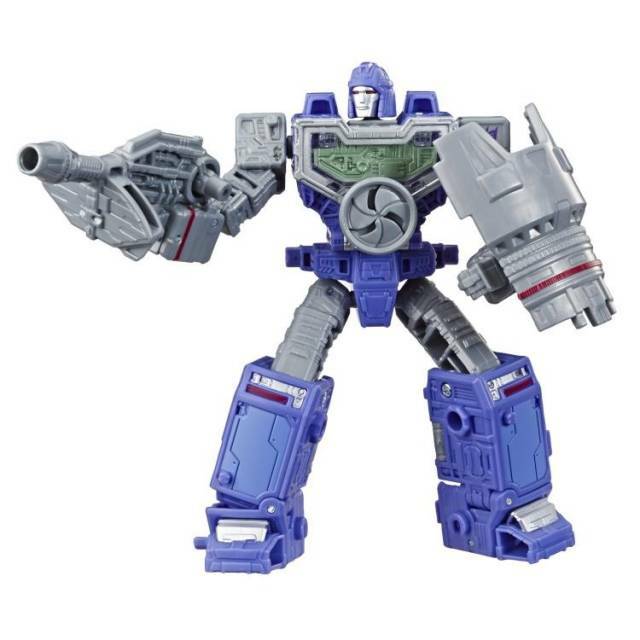 It also allows the shoulder "turbines" to stay flipped at least part-way out. Since I preordered, I got an extra giant sword and set of smaller guns and swords. That's really nice for rounding out armaments for my collection. However, it does have problems. I had to file down the pegs on both hands to get them to fit. Once I got them in, turning them would cause them to pop out again. The bonus sword included with mine had a broken handle. He can still hold it (there's a bulge with which he holds these swords). The rear skirt armor piece is hard to get on, and actually developed stress marks after taking it off and reattaching. It's *that* tight. My biggest complaint though is in the wrists. The wrists are incapable of holding the combiner-sized sword at any kind of angle. It just falls forward. If you're OK with posing it with the sword down or on a shoulder, it works, but action poses are right-out. I wouldn't say I'm unhappy, but TDW clearly needs more QC work. The issues with this kit have certainly given me reason to not jump on their Predaking upgrade. Get this Upgrade Kit Now!!! As soon as I assembled my Dinobots into their combiner mode, I knew they were in desperate need of some help. I waited for the upgrade kit to show up and had the PE sets in my Stack, but when Dream Wave showed up, I switched immediately. The Dream Wave set takes Volcanicus from a sickly robot to a Powerhouse combiner. His presence on my shelf has completely changed. He now looks like an unstoppable force of rage and power. His stability and bulk are no longer problems, and he has a freaking sword now!! As I look at it, Volcanic is a Transformer all on his own, and I don't think he will ever become the individual Dinobots again, so the extra weapons are pointless to me unless I get a second set. PE's version does have the fixes for Grimlock, but since I am keeping Volcanicus together that didn't seem to be a necessity for me. If you are on the fence about which upgrade set to get I highly recommend Dream Waves. We all agree that Volcanicus is flimzy and a deception when we combine it for the first time. 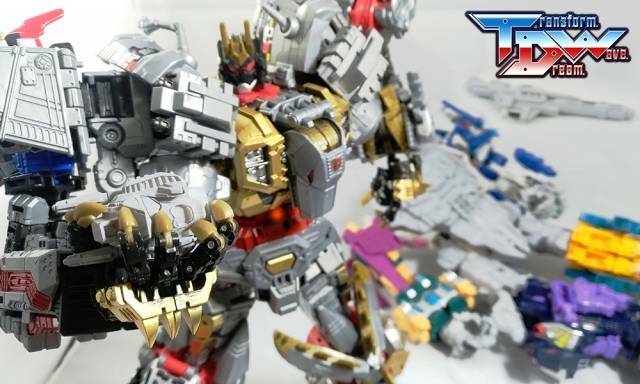 With this kit, it become a real combiner that has the class needed to become a real part of the dinobots history! 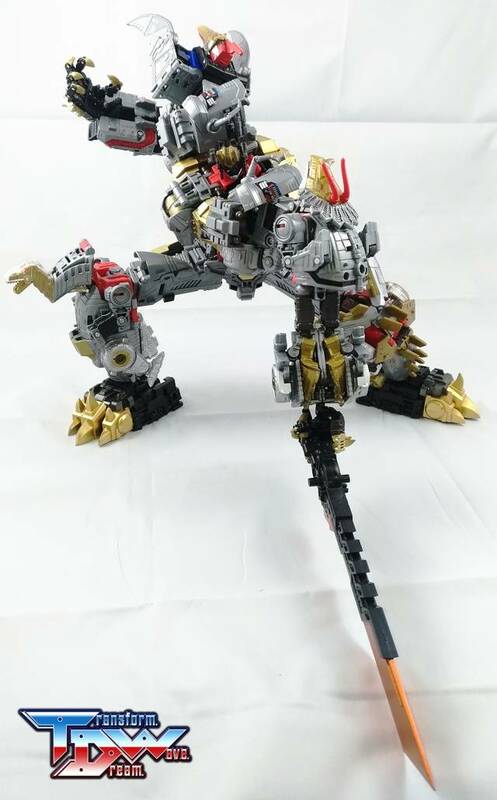 Even if it's difficult to put the hands and the feets, this kit is really awesome and a must have when you have Volcanicus. Worth every cent put un that upgrade kit! a must!! This the kit you want to have for your Volcanicus. You get everything and more in one set. Hands, ratcheting feet, body and torso parts, and one big sword. 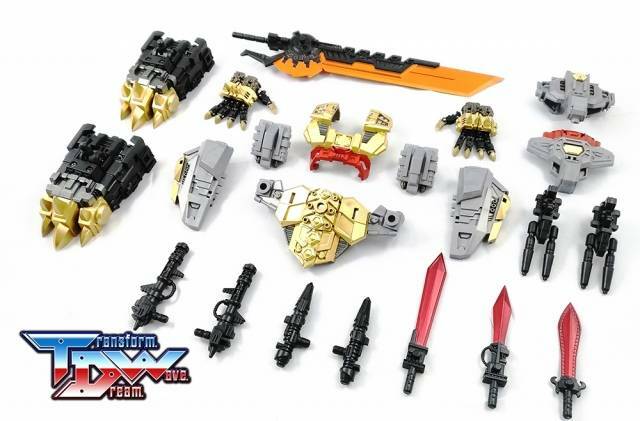 You also get extra weapons for the dinobots for their robot modes. Why pay for 2 kits when you can save more with one. I highly recommend this set. got this as a gift, after fighting to get the feet on, gave up after only managing to get one hand in place as the pegs on everything aren't very uniform. Balance is still a big issue, and sadly , mine fell over for no reason and broke two of the very delicate fingers off at the knuckle. so it needs some refinement. the skirt armor, if you follow the order of directions is impossible to put on. have to do that part first. grimlocks knees on mine can barely hold the added weight up top. First off, we have to acknowledge that POTP Volcanicus is not great quality to begin with. All my individual bots had problems with loose joints and pegs that wouldn't stick which made my combined Volcanicus barely able to support is own weight and very disproportionate. The POTP combiner hands and feet are garbage and the bots don't have all of their signature accessories. This is why I looked so heavily at the different upgrade kits on the market. The one dream wave kit comes with everything you need whereas PE had 2 separate kits and a greater cost. Volcanicus looks much better now that I installed the Dream Wave kit; however, it didn't fix the stability issues. The thigh pieces add mass to the legs in the right spot and they are big to the point his waist now supports itself, but they limit the thigh rotation. The back plate seems to attach the arms in an awkward position. And, the hands and feet require some force and finesse to get into the ports. I did this without damaging the bots, but now I noticed that 1 foot keeps falling out. 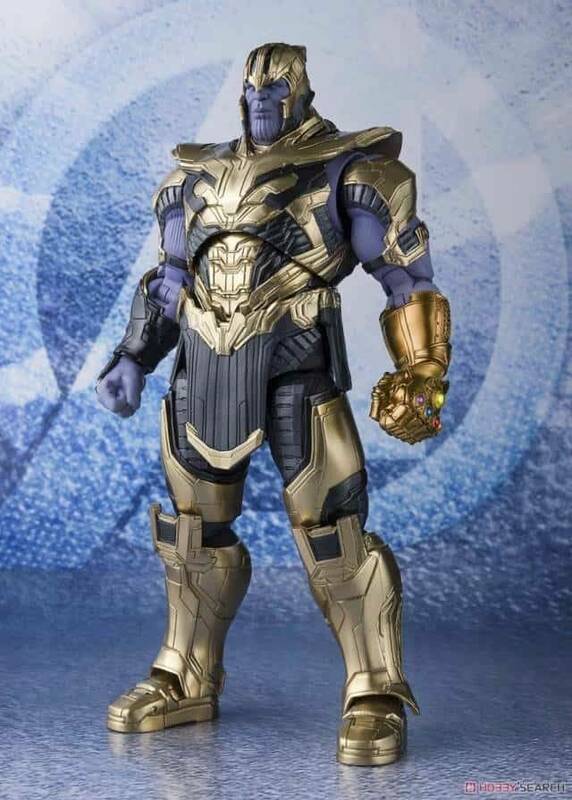 I love the chest and the accessories, although I will keep him combined, making most of the individual accessories useless. The kit is worthwhile if you want a Volcanicus to display. You can't play with him because he's fragile and Hasbro's terribly QC and weak joints severly limit posing. But again, if you want a Volcanicus and don't want to cringe every time you look at him, this kit is a must buy. This set looks super fierce and adds some much needed stability to the upper torso. Unfortunately I've found that every peg for the combiner hands and feet is slightly too big to fit into the holes. I had to carefully shave down every "5mm" peg to get them to fit into the arm and foot ports. On the flip side several of the storage pegs on the swords are slightly too small to be of any use. Lastly the piece that hold grimlock's thighs together and forms back skirt armor just does not fit. The instructions made it look super easy but no matter what I do It feels like its going to break and there does not seem like enough clearance. 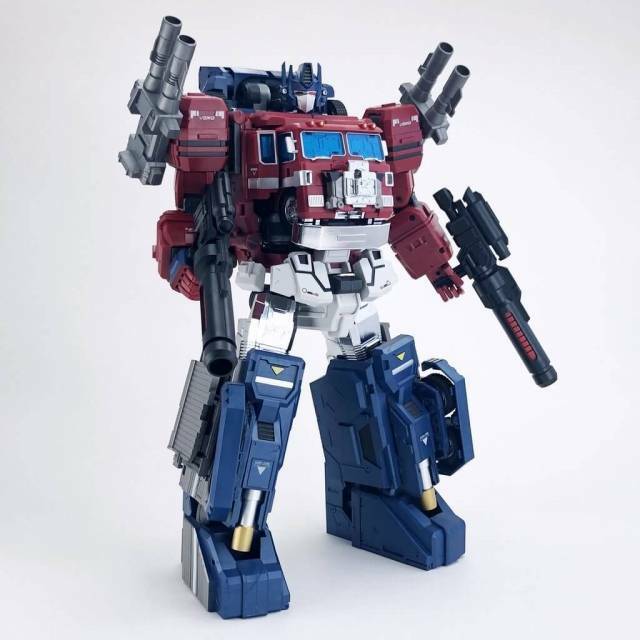 Still think its a great kit I especially love the swords both for the combined mode and single bots, I'm just sad that it had so many obnoxious flaws, if not for those I would have wholeheartedly given this 5 stars. amazing kit. Makes volcanicus sturdy and not fall apart ,never mind making it look 1000x better. Can’t beat it especially for the price.